What a crazy week that I didn't even get time to do this post until this morning before I head to work! A full week of work, olympics and wedding to do list followed by a weekend full of socializing, pool side and we bought a car!! What did you do 20 days before your wedding, yep we bought a car. Pictures to come soon, still trying to get my head around it all! How was your week? 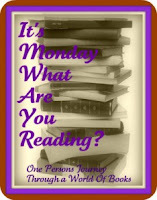 Check out what I'm reading and enter for a giveaway!